According to an analysis of a new school accountability system developed by six California school districts including LA Unified, the district’s 13 lowest performers are all elementary schools, the best high school is Harbor Teacher Prep Academy and the worst high school is Jordan High. These conclusions were made following an LA School Report analysis of LA Unified schools evaluated by the California Office to Reform Education (CORE). While the accountability system was unveiled in February, CORE and LA Unified did not provide any analysis, but now you can see the average score for the district, the top and bottom schools and compare schools of similar types or similar sizes. The chart shows whether the school is elementary, middle or high school; the school’s CORE score, starting with the lowest scores; the population of the school, and the link to the school’s complete CORE assessment. Without this analysis, all that could previously be learned was a school’s individual score without any perspective. Is Van Nuys High‘s score of 76 good, bad or average? Turns out it is good, or at least above average, since the average score was 60.17. The system works on a scale of 1 to 100, with 100 being the best. A total of 714 LA Unified schools were entered into the CORE system. Independent charter schools were not included, nor were special education centers, early education centers, adult education centers and continuation schools, which are small schools that serve struggling students. On the bottom end of the scale, LA Unified’s lowest scoring school was Florence Griffith Joyner Elementary, which scored a 15. The other poorest performers were One Hundred Seventh Street Elementary (16), Hillcrest Drive Elementary (16), Century Park Elementary (17), Annalee Avenue Elementary (19), Barton Hill Elementary (19) and Cabrillo Avenue Elementary (19). CORE takes a multilayered approach to ranking and evaluating schools. The new system is not just based off standardized test scores, like the old Academic Performance Index (API), but also incorporates new data like graduation rates, attendance rates, suspension rates and the performance of certain subgroups like English learners. The API system was discontinued after 2013 while the state converted to the Common Core-aligned Smarter Balanced tests, which began statewide in 2015. California is in the process of developing a new accountability system that will satisfy the requirements of the new federal Every Student Succeeds Act (ESSA). Some experts believe the state will use some of the same data used in the CORE system but not provide a single number to rank schools, instead using a “dashboard” of multiple results that would include numerical rankings. Under ESSA, the state must identify the bottom five percent of its schools for intervention, but it is unclear how the state will do so without a numerical ranking system. Eliminating numerical rankings has been criticized by some groups who believe such rankings are key to improving the state’s schools. The California Charter Schools Association, for one, is not in favor the dashboard approach. “CORE’s system of measuring multiple aspects of a school’s performance and student outcomes, which are then tabulated to create a single index, is thoughtful and comprehensive,” CCSA said in statement to LA School Report. “Unfortunately the state is moving toward a different system — a complex dashboard that allows a whole series of standards to be interpreted at the local level. This would create a climate of unequal treatment and uncertainty, instead of the clear, accessible, statewide standards that California public schools need. Families need these standards to understand how the schools in their communities are performing. The CORE index was developed by LA Unified and five other districts as part of a deal with the federal government. The districts banded together for the purpose of getting a much-desired waiver in 2013 from the stringent mandates of the No Child Left Behind law, and part of the waiver required them to develop a comprehensive way of evaluating and ranking schools. CORE became the first non-state to get a waiver. Opening up a school’s report reveals the inner workings of how the score was compiled. The overall score is based on a formula where 60 percent is for academic performance and 40 percent is for socio-emotional/culture climate factors. Individual categories are given a score of 1 through 10, which are then added up for an overall 1 through 100 score. For Florence Griffith Joyner, the poor score was the result of criteria like high absenteeism over the 2013-14 and 2014-15 school years, which was 21 percent and 25 percent, respectively. CORE ranks these percentages as a 1 out of 10. The school’s suspension rate of 2.33 percent and 4.67 percent over the two years earned it a 3 out of 10. For performance on the 2015 Smarter Balanced standardized test scores, only 11 percent of Florence Griffith Joyner’s students met or exceeded English Language arts standards, and only 12 percent met or exceeded the math standards. These results were far below the district-wide average of 33 percent for English and 25 percent for math. 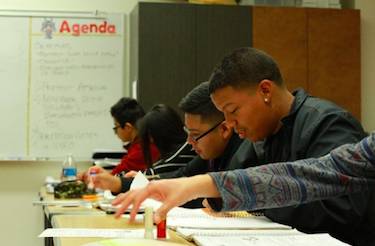 For Harbor Teacher Prep Academy, the perfect score was the result of factors like a 1 percent chronic absenteeism rate over the two years and a zero percent suspension rate. On the Smarter Balanced test scores, 83 percent of students met or exceeded the English standards and 81 percent met or exceeded the math standards. One limitation to CORE’s data is that it did not separate out span schools, which include students from more than just elementary school, middle school or high school. A span school may have students from grades 6-12, but CORE only list schools as either an elementary school, middle school or high school. So a span school that includes middle school students and high school students is listed twice on the CORE list, but with the same scores and same student population, so the scores from the two age groups only count as one score. This would skew the overall average for all schools, as well as impact the individual score for a school listed twice. The five lowest performing high schools are David Starr Jordan Senior High (22), Early College Academy-LA Trade Tech College (23), Leadership in Entertainment and Media Arts (LEMA) (34), Dr. Maya Angelou Community High (37) and Augustus F. Hawkins High A Critical Design and Gaming (37). After Harbor Teacher Prep, the four top performing high schools are all magnet schools: Math, Science, & Technology Magnet Academy at Roosevelt High (98), Downtown Business High (97), Francisco Bravo Medical Magnet High (96) and King/Drew Medical Magnet High (96). After Balboa, Solano, Clover and Porter Ranch, the fifth-best ranking for elementary schools is a five-way tie with Wonderland Avenue Elementary (97), Welby Way Elementary Charter (97), Roscomare Road Elementary (97), Clifford Street Elementary (97) and Canyon Charter Elementary (97). The bottom five middle schools are Edwin Markham Middle (23), Loren Miller Elementary (26), Samuel Gompers Middle (27), Horace Mann Junior High (28) and Thomas A. Edison Middle School (28). The top five middle schools are Alfred B. Nobel Charter Middle (91), Hesby Oaks Leadership Charter (90), Robert Frost Middle (89), Los Angeles Center for Enriched Studies (88) and Paul Revere Charter Middle (87).